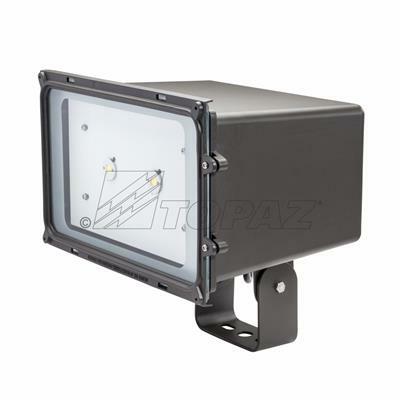 Topaz’s new LED Traditional Flood Light series are the perfect choice for new construction or spot replacement in commercial and industrial facilities. With a clean, traditional housing design, our flood light series helps businesses transition to the many advantages of LED illumination. Engineered to maximize light output and optimize energy efficiency, our fixtures are ideal for illuminating building façades, walkways and security areas. Multiple mounting options enable easy installation in a variety of locations. Our 22 and 44 watt traditional design incorporates tempered lenses and a rugged, die-cast aluminum powder coated housing that is resistant to damage from UV rays, rain and snow. Topaz’s fixtures take a bite out of your overhead with their superior life expectancy, eliminating stocking, maintenance and future replacement costs.